DDG Board members and visitors at the meeting in Santo Domingo on February 13, 2017. From left, front row: Missionary Karen Carroll, Diocese of the Dominican Republic; Julia Ariail, Georgia, Secretary; Bill Kunkle, Southwest Florida, Executive Director; The Rt. Rev. Moisés Quezada, Dominican Republic; The Rt. Rev. Julio C. Holguín, Dominican Republic, First Vice-President; The Rt. Rev. Wendell N. Gibbs, Jr., Michigan, Second Vice-President; The Rev. Deacon Beth Drew, President, Western Michigan; Patricia Martin, Dominican Republic. Back row: Missionary Charlie Nakash, Dominican Republic; John Gruetzmacher, The Episcopal Church in South Carolina; The Rev. Marshall Huey, South Carolina; Sally Thompson, Southwest Florida; David Morrow, Northwest Texas, Treasurer; The Rev. Tar Drazdowski, Nebraska; The Rev. Ed Miller, Virginia; The Rev. Sandy Key, New York; Katie Forsyth, Eastern Michigan; The Rev. Deacon Alexander Romero, Dominican Republic; The Rev. Hilario Albert, New York; Julius Ariail, Georgia. The 2017 Annual Meeting was held on Monday, February 13th, at the diocesan office in Santo Domingo. 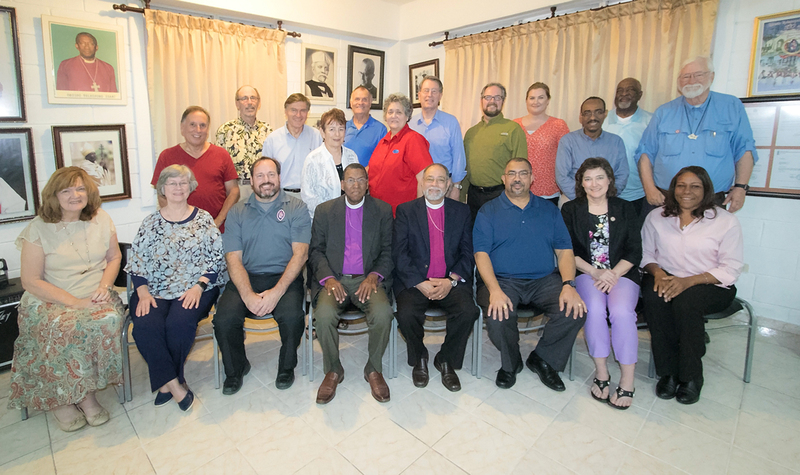 The Board Meeting followed the annual convention of the Diocese of the Dominican Republic which was held in Boca Chica on February 10-11.